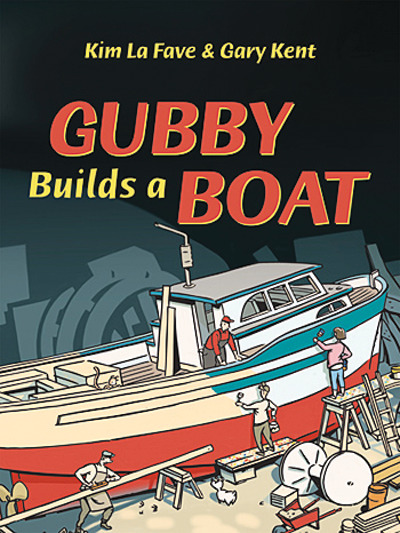 Set on the west coast of Canada, Gubby Builds a Boat is a story told in comic book format: the illustrations and characters with speech bubbles move the story along in several picture boxes on each page. Narration boxes add factual information and fill in the story line when necessary. In this tale, which follows the previously released Fishing with Gubby, the troller that Gubby has been fishing in for years is leaking and showing serious signs of old age. Gubby decides it’s time to replace her with a gillnetter. He heads out from the village of Gibsons to Steveston to consult with his old friend Minoru, a Japanese boat builder who learned his craft from his father. Together they build a new wooden boat over the winter season. The building process is documented, step-by-step, by Kim La Fave’s illustrations. Classroom Connections: In addition to its obvious relevance to a study about the ocean and how it provides food for our consumption, Gubby Builds a Boat tells a story about cooperation, friendship and community. It touches on the history of Canada, which includes Japanese immigration, and the culture of coastal communities. It could be used as a model for students to create a story combining illustrations and words.